I’m going to die. Okay, I got that one out of the way. Yes, I’m going to die. No, I most gratefully do not have a terminal disease that I know of. However, I am all of a sudden (as in the last year) starting to actually think about the art of dying. Because though it is oft-repeated cliche, it’s also actually true: If you can plan and get past your own death, you truly, truly are free to live. What is it that I want people to remember about me when I’m gone? More importantly: What is it that I still want to do? Still must do? What gives me joy and most honestly–what steals and kills it? I realize there are some things holding me back. For a few years I’ve been handling the status quo despite dizzying headaches and a chestpain that never seems to subside. Despite trying my darndest to eat mostly healthy, take supplements, exercise at least a couple of times a week and not freak out despite areas of life we aren’t sufficiently prepared for. WHY CAN’T I SEEM TO HANDLE MY LIFE ANYMORE? It’s no longer satisfying enough for me to survive each day. My spirit is begging me: PLEASE….let me LIVE….AGAIN! I remember who you were, do you? You may have heard of it. It’s also known as the Swedish Art of Death Cleaning. It’s not morbid at all. In fact it’s super freeing. At least it looks like it is. That’s because I’ve just begun. But I have started. Consciously. This is Swedish Death Cleaning: You start systematically going through and purging your stuff that would not bring others joy, were you to pass. You get what you choose in life. If my life is challenging, it is because I have elected to make it so. I have made it so by the dreadful disease of hanging on. Not just stuff. Emotions too. For every object I own, there must be ten corresponding feelings that go with it. To toss the object, means to throw away a part of myself. Or does it? After consulting the internet and articles and videos, I can unequivocally confess that I hang on to memories and souveniers and items….most all of them. It’s as if I spent 30 years of my life documenting through photos and writing and saving trinkets from trips and memorabilia as proof that life my life–my family’s life was good. Proof, that I was a good mom. That I took my kids to some amazing places. That despite challenges and setbacks, our family had a fantastic time here. But in the process of saving and documenting all these memories, I lost sight of something: My kids have grown up, save one– our baby, who at nearly 13, is 2/3 grown! It’s painfully sad, but childhood is actually a short chapter in our lives, despite a few long days. Albums from my childhood. Wait, you’re a Millennial and you’re telling me you don’t want to listen to Mom’s old favorite music? What’s that? You say you can just listen to it on Spotify if ever interested? Oh. I will prayerfully and hopefully and with encouragement begin a year of Döstädning. Though it is emotionally painful to release things, I am going to try to anyway. If I were to die tomorrow, what my kids would inherit would be cruel and inhumane. It would be a house full of scrapbooks and notebooks and clothes and books. If I haven’t put it together well in all these years, how on earth could they do it in days to weeks? I must think about this. I choose to think about this with joy, not self-condemnation, but with a divine sense of urgency because I love them so. So with that, starting today, I will live different. I will be giving less gifts and I’m also begging others for less. I don’t want things from people. I do want genuine face-to-face time, not texting, emailing, or that altogether phony but noble indefinite plan to get together “someday soon”. I want to be free to wake up and be creative. Or active. Or responsible. Or all of the above. But it’s impossible, if I’m chained to objects and the repositioning of them, as opposed to the releasing of them and in return the freeing of myself. It’s going to take a while. One doesn’t get fat overnight. Neither does one get fat with stuff suddenly. Like a new diet and exercise routine, it’s going to take some profound spiritual muscle and some heavy mental lifting. I suspect I’ll be doing a lot of crying, so I am allowing myself a small fund for tissues. But otherwise, NO NEW STUFF! It will take time: Boxing up and donating or selling will mean choosing how to spend my time with intention. It will take mental energy even when I’m physically tired. I will do it anyway. It will take courage: This was so special to me, but I’m choosing to let it go. It will take efficient time management: Dear Lord, since seconds count in life, help me decide swiftly and efficiently as I handle this object. It will take prayer: Beloved object, mere thing–you served me so well at one time, but it is now time for us to part. I now put you in the garbage and bid you adieu. Perhaps some prayers will be painful: You are attached to a sad or painful memory to me; I no longer need to hang on to you. I am purposely choosing to let you go. Or perhaps this prayer: Dear object, gift from someone I truly love: I was not a good steward of you. Whether it was personal taste or disorganization, I did not enjoy you. It is with love, I fondly remember the giver as I release you, said object, into other hands or a new dimension for you. God: I had an amazing life, overflowing with people and moments and blessings galore! I got so much more than I deserved! Thank you! These are the things I hold in my heart through every transition of life: Love. That’s it. One word. The only thing that we truly carry from this world to the next. Let the gentle purging process begin. By the way, my neighbor wrote the second book. Because when you let it go, you’re free to do what you love! Once upon a time in my life, a big crisis came. BANG! It was big. How big? Big enough to rock my world, and tilt my universe. But you know what? It didn’t kill me. Though I thought it might. It certainly had the potential to. I thought I didn’t have the strength to go one more day. But the next day, the sun rose again, and my feet found the floor and moved forward. I didn’t think I could handle it. And I was right. In my own strength, I couldn’t. I didn’t. And I’m not. But with God, all things are possible! (Matthew 19:26) That’s what’s engraved in the cross around my neck, and even more it’s invisibly etched in my heart; it’s the fiber of who I am. Why did this happen to me? Our family? The person I love? If God is good, why didn’t He PREVENT this? Or FIX it? Or for God’s sake, allow me (us) to AVOID it all together? I’ll tell you why. Because none of us are spared. In this world, you will have troubles…..
You know it all too well. If you’ve suffered, you know John 16:33 by heart by now. Okay then, what does it all mean? What’s the point of anything in life? If I never get the WHY of my questions answered, then how do I incorporate this into my life without being bulldozed by it? How can I choose my suffering so that I can thrive, not just survive? The wisdom to know that when fear creeps in, He is bigger than all of this and returns the moment I ask for Him to. I took a picture of the moon tonight. At first glance it was just a white dot in a black background. I shot it from multiple exposure values: aperture sizes (determines the amount of light let into the lens), and shutter speeds (how long the shutter remains open). You know what? Despite subtle differences, the pictures looked pretty much the same. Dull. Listless. But once I opened it up in my favorite photo editing app appropriately named LightRoom, I pulled the lever labeled “Clarity” over to the right about 100% to be exact. And voila! Stars appeared. Stars I didn’t even see with my naked eye when I originally took the picture. I zoomed in on the moon to enlarge it a bit. More detail popped out, though somewhat hazy still to my eye. You see I am limited by the lens through which I view all this. Not just my camera lens, but also my human optical lens. Life is like that. We see our circumstances through the lens of our own understanding. And thus we are born into a life of pain. We sometimes don’t get to see the diamond that is being cut out of the roughness of our life. 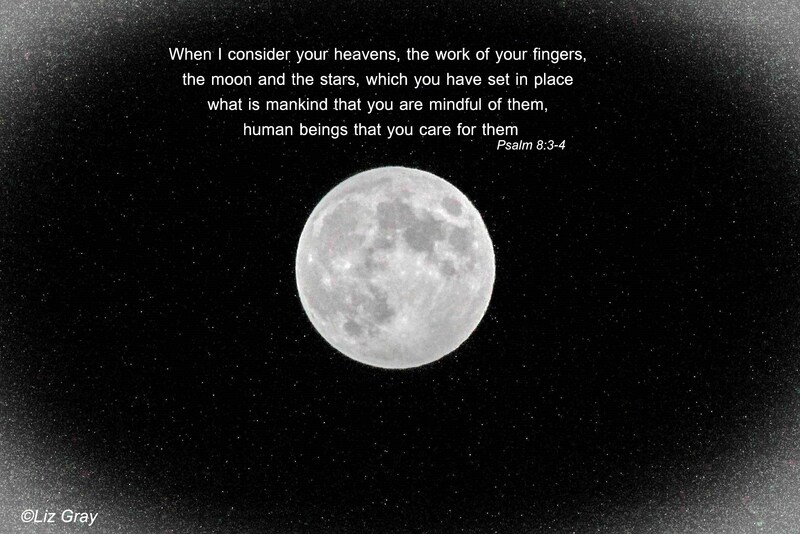 But God, with his infinite all-seeing eye, who created the moon, the stars, the earth, all the solar systems, and the entire universe, can always see all these details that we can’t. We feel bitter tears slip from our eyes, but He only sees stars. It is here, He best sees into us; He looks deep into the windows of our soul, and plants a new vision. During our trials, is where God best plants the vision of hope, endurance, peace, and someday—joy. Life, like photography is about perspective. It’s about vision. It’s also about clarity. There’s contrast involved—we can’t know light (goodness) if we don’t have darkness (evil) to compare it with. We see our life thru a macro lens, up close and personal. But God sees our lives (the big picture) from a wide angle lens that makes the Gran Telescopio Canarias (it has an aperture of a whopping 409 inches!) seems like the width of a gnat. He also can see very detail up close, as if using an electron microscope, seeing the detail of our cells not even a billionth of a meter wide. He can see every speck of us—perfectly. And He can see within us, what others can’t and sometimes what even we can’t see in ourselves: Our hurts, our dreams, our fears, our desires, our hopes, our passions, our purpose, and most of all: our potential. Sooner or later in life you may have one of those cataclysmic events that can only be described as The Big Bang. The rest of the world hums merrily along unaware that you nearly lost your hearing, your vision, your sanity, and quite possibly your life as this cosmic collision internally implodes in your life. But hold fast. Trust in a God big enough to swallow your fears and your doubts. Through applied pressure, extreme heat, and gravitational pull, know that God is forging something, better, refined, and new. He ordered the universe outside of you; He can certainly order, rearrange, or repair if necessary, the micro verse within you. Wait upon Him. Something beautiful is being made from all this. Trust in Him to reveal it all at exactly the right time.